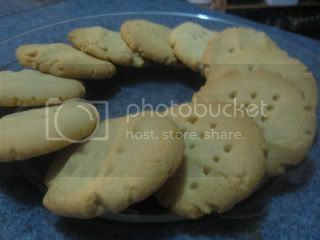 As I promised I now have pictures of the Brown Sugar Shortbread. If you have been considering making shortbread you should try this recipe. The dough even freezes well! A few days ago we brought the Taste Of Home: Best Loved Cookies & Candies 2010 magazine. It is filled with 245 cookie and candy recipes that look amazing. Last night was our church’s business meeting, for which we needed a snack. I decided on the Brown Sugar Shortbread from page 31 in our new magazine. You can also get the recipe on the Taste Of Home Website here. They were wonderful! I made a double batch of them and they were gone before we left church. Next time I make them I will probably add some almond extract to make them even better ( I want to make more today). Sadly I forgot to take a picture, next time I make them I will make sure to get a picture to post on here.